Mullingar’s Derek McGee doubled up to win the Supersport and Grand Final races at the Faugheen 50 road races on Sunday in Carrick-on- Suir in Co Tipperary. McGee narrowly held off Dublin’s Derek Sheils to win the big race of the day on Noel Williamson’s BMW. Waterford’s Brian McCormack completed the top three. McGee also had the edge over his rivals in the Supersport class and chalked up his second win in a row on his Yamaha R6 after he also emerged victorious at Walderstown. Sheils again had to settle for the runner-up spot on the Cookstown B.E. Racing Honda with Sweeney on the rostrum in third ahead of Jordan and Czech rider Michal Dokoupil. 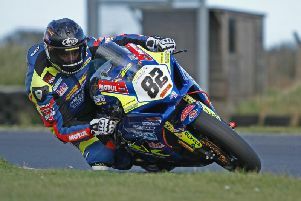 Earlier in the day, Sheils won the re-started Open Superbike race from McGee and McCormack to maintain his excellent run of form on John Burrows’ big Suzuki and is now set to be crowned Irish champion with two rounds remaining at Armoy and Killalane. Jordan came out on top in the 125cc race from Adam McLean and Nigel Moore. Skerries man Sweeney won the Supertwins race ahead of Sheils. Ballymoney’s Seamus Elliott was involved in a crash on his Kawasaki ZX-10R, causing the Open Superbike race to be re-started. On Saturday, Cork’s Brian Coomey was injured following an incident during practice.